God calls us to set the captives free. Today’s first reading from Exodus presents us with an extraordinary image: God appears to Moses in a burning bush, instructing him to remove his sandals, for he is standing on holy ground. Yet it is also a story of God coming to us in our ordinary lives: Moses is herding his father-in-law’s sheep at the time. Imagining Moses leading his flock across the desert reminds me of time spent in the Sonoran Desert in Arizona, here in the United States. The desert landscape is marked by signs of migration: worn out shoes and empty water bottles dot the unforgiving terrain. Graffiti scrawled on a highway overpass reading “White Pride” sends a clear message to those desperately seeking asylum. Makeshift altars combine recovered clothing, rosaries and photographs with crosses to commemorate those who have attempted the journey. As a window into the plight of those forced from home, these desert walks have been encounters on holy ground. We don’t have to walk in the desert or witness a miraculous sight to recognize that we are standing on holy ground. As with Moses, God interrupts our ordinary lives, as well. We experience moments when something perceptibly shifts and we become aware of the sacred quality of the encounter. As parents, honest conversations with our children about troubling headlines or their own experiences of injustice can bring us onto holy ground. I think of office hours with students, where conversations may start out treating course material, but veer into more meaningful questions about vocation or personal struggle. Perhaps we find ourselves on holy ground when we choose a path that takes courage even when, like Moses, we struggle with real doubts. Tending sheep Moses stumbles upon Mount Sinai, and out of this fiery presence, no doubt frightening yet alluring, God comes to him, the perennial outsider. It is Moses—estranged from the Hebrews, a criminal taking refuge—who encounters the God of Abraham, Isaac, and Jacob. God’s message to Moses is one of compassionate liberation for those who suffer: “I have heard the cry of my people and come down to rescue them.” God calls Moses to go back to Pharaoh and lead the Israelites out of slavery and into the promised land of Canaan. We too are invited to join in this mission of freeing captives for abundant life. It is in light of the Israelites’ own experience of suffering that God frames laws for the treatment of outsiders: “You shall not wrong or oppress a resident alien; for you were aliens in the land of Egypt.” Indeed, after the commandment to worship only one God, no moral imperative is repeated more frequently in the Hebrew Scriptures than this command to care for the stranger (the ger). Across our globe in unprecedented numbers, women, children and men cross borders. They flee gang violence, food insecurity, and proxy wars. Too often we become numb to statistics or cynical in the face of politicians’ manipulative rhetoric. Yet God’s clear summons interrupts: Who is crying out in our midst, and what insulates us from their cries? As modern forms of Empire continue to exploit, what idols prevent us from showing hospitality? How are our own lives bound up with deaths in the Mediterranean or the Sonoran Desert. In today’s Gospel reading from Luke, Jesus reminds us that God’s justice is marked not only by liberation but by mercy. His parable of the fig tree reveals how God is patient with us even when we turn away, even when our lives do not immediately appear to bear fruit. The vineyard owner instructs his gardener to cut down the tree because it has not borne fruit in three years. The gardener asks the owner to leave it for one more year, promising to fertilize it, but indicating the owner can cut it down if it still fails to produce. Lent offers us a time to reflect on the ways in which we must repent and prune in order to grow. Jesus offers the parable in response to his disciples’ questions about the severity of different Galileans’ sins. So whereas today’s gospel demands we bear fruit, it also warns against self-righteousness. Sometimes we are more concerned with calling others out than imitating the mercy God shows us again and again. Why should they exhaust the soil? Yet responding to God’s prophetic call in Exodus often requires the mercy and patience God shows in Luke’s gospel—we are called not only to resist empire and release the captives, but also to bridge-build and forgive. God of one more year, I Am Who Am, you call us to liberating solidarity with those considered “outsiders” in our midst. Together we are standing on Holy Ground. 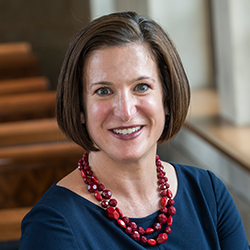 Kristin E. Heyer is professor of theological ethics at Boston College. She received her B.A. from Brown University and her Ph.D. in theological ethics from Boston College. Her books include Kinship Across Borders: A Christian Ethic of Immigration (2012) and Prophetic and Public: the Social Witness of U.S. Catholicism (2006), which won the College Theology Society’s “Best Book Award,” both published with Georgetown University Press. She has also published the co-edited volumes Public Theology and the Global Common Good: The Contribution of David Hollenbach (Orbis Press, 2016); Conscience and Catholicism: Rights, Responsibilities and Institutional Responses (Orbis Press, 2015) and Catholics and Politics: Dynamic Tensions between Faith and Power (Georgetown University Press, 2008). Her articles have appeared in Theological Studies,The Journal of the Society of Christian Ethics, The Journal of Catholic Social Thought, Political Theology, Asian Horizons, The Journal of Religion and Society, Health Care Ethics, New Theology Review, Commonweal and America. Prior to returning to Boston College, she taught at Loyola Marymount University and Santa Clara University. She teaches courses on moral agency, migration ethics, Catholic social thought, and HIV/AIDS. She also serves as graduate director for the theology department. She has lectured widely in the United States, Europe, and India on such topics as immigration, the common good tradition, Catholic social movements, and feminist ethics. She serves as co-chair of the planning committee for Catholic Theological Ethics in the World Church, a global network that fosters connections within the world church. She has also served on the boards of the Catholic Theological Society of America, the Moral Traditions Series at Georgetown University Press, and the Seminar on Jesuit Higher Education. She and her husband, Mark Potter, are raising two sons in Newton, Massachusetts.